Positano, Italy is a city of stairs. They say there are more than a million. They have only 2 roads, the Amalfi Coast Road which winds through high up on the mountain and is not useful for walking in town and a one way road that leaves the Amalfi Coast Roads high up and winds down to the center of Positano and then back up to the Amalfi Coast Road. This one way road is great for walking from one end of town to the other. There is a cheap local bus that starts down town and goes up the one way road to the Amalfi Coast Road and then back to the start of the one way road and back down to town. Some hair pin curves are so tight the bus needs to back up to get around them. Basically everything else in this wonderful town is on stairs (with street names). We stayed 104 steps up from the one way road and another 500 steps down to the beach. There is also a pathway from the large beach to the small beach which is known as lovers lane. You have to be able to handle some number of steps to get around this town. But it is worth the work out. The higher you go up the mountain the better the views and the better the restaurants (some say). 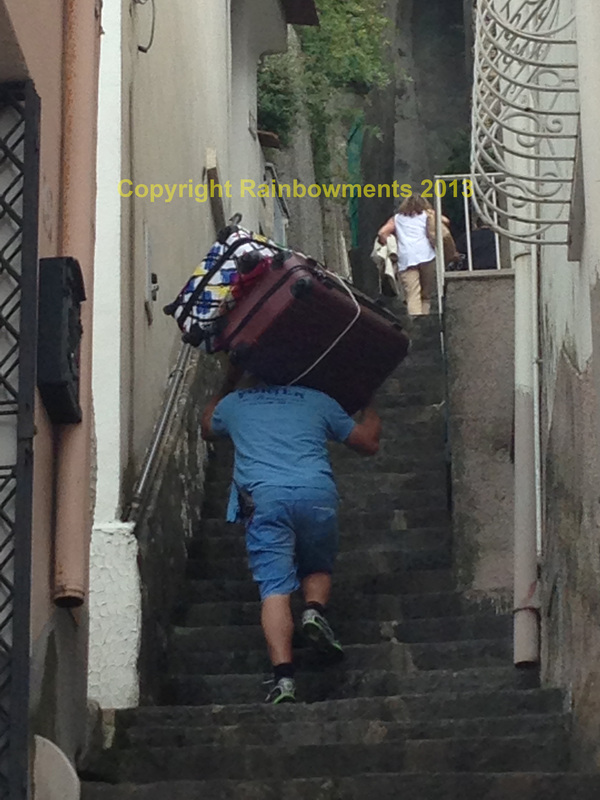 If you are staying up a hundred or more steps hire a porter to carry your bags. Our two big bags weighted 50 lbs. each. Our porter bungeed them together and carried them up the 104 steps at a very fast pace. The cost is 7 Euros per suitcase or 8 Euros for big suitcases like ours.